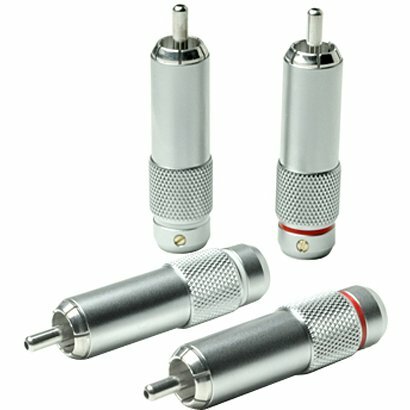 The newly developed original RCA plug with Collet screw chuch for secure connectionThe “GENESIS” is the original RCA plug with their new collet chuck clamping device.This newly improved collet chuck structure which is placed on the lower middle of the sleeve actualizes secure holding to the connection part due to its independence from the outer sleeve.In In addition, because of the coating of high-viscosity grease on the screw part, you have never felt like this smooth rotation before.It is not only for your feeling pleasure but also for the vibration damping between the inner body and the outer sleeve.On the surface of its brass sleeve is treated by hard chromate plating like quality cameras.In addition, Oyaide employed phosphor bronze contact pin.And they applyed our new combination of platinum + rhodium plating for our original RCA plug.This combination sets you the new standard of sound for audiophile. Furthermore, all fine parts are shaped by highly accurate CNC routing machine.The “GENESIS” will bring the higher standard of the architectural quality of the existing RCA connecters.The collet chuck clamping functionThe collet chuck clamping functionThe collet chuck clamping function is employed for “GENESIS”.Although an existing collet chuck RCA plug is tightened by rotating its whole sleeve,GENESIS is tightened by its independent rocking sleeve.Herewith we succeeded to minimize the gap in between its body and sleeve and attenuate resonance which has been a problem for existing collet check structure.BodyThe high-viscosity greas is coated on the screw part of rocking sleeve and body.Due to its high-viscosity, it actualizes to prevent looseness and damp unnecessary vibrations.In addition, each screw thread of the rocking sleeve and end cap has different pitch and oposite screw turn for tightness.UsabilityIts collet chuck rocking sleeve is placed on the lower middle of the sleeve.So, it is easy to turn it even if it is under the situation where it seems to be hard to rotate.SpecMaterialsContact : Phosphor bronzeInsert resin : PTFEOuter shell : Copper alloy（RoHS Compliant）Cable clamp : Copper alloy（RoHS Compliant）PlatingsContact pin : Platinum ＋ RhodiumBody : Platinum ＋ RhodiumOuter shell : Hard chromeConnection:Soldering:Install O.D. : ~9.0mmPackage:4 pieces in a boxRelease date:2009/11/20ShippingShipped via registered airmail from Japan to WORLDWIDEShipping to South America, Africa, please feel free to contact for fee.PaymentPlease pay with PAYPAL.About usWe are located in Saitama Japan, a suburban city of Tokyo. Very convenient place to find item, information about Japan.We sell Japanese goods here. Thanks for looking!